Installing cavity wall insulation is one of the most cost effective ways of retaining significant amounts of heat and reducing your heating bills as as result. Many homes built after 1920 were constructed with a cavity between the outer and inner walls, these cavities significantly helped reduce damp and keep houses warmer than the single skinned walls that predated them, but there are still improvements to be had. By filling the cavity with an insulating material such as polystyrene beads or mineral wool you can retain as much as 33% of the heat that would have previously been lost through the cavity, and it’s all relatively simple to do. This means that for every £3 you spend on your heating bill, £1 escapes through your walls and heats the outside air instead. A surveyor will measure your walls, deduct the area of the windows and doors resulting in the amount of insulating material that is required. Holes will be drilled into the wall by the installation team who will then pump the material into the cavity. The job, when carried out by a professional, is relatively simple and is a low cost method of gaining significant savings. Many people are eligible for financial help to improve the insulation in their home in the form of ECO grants from the UK government. For some people this enables them to insulate their home for free or at a much cheaper cost. Over and above the significant savings on your central heating bills you will also notice that your home will be cooler in summer, all due to the improved insulating properties of the walls, it will also help reduce condensation on the walls and ceilings and provide a more stable and even temperature throughout the home. Is My House Suitable for Cavity Wall Insulation? 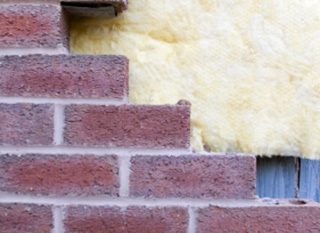 There are 3 ways to see whether your house has cavity wall. Houses built after 1982 are likely to have cavity walls as standard. 2. Check the configuration of the bricks in your house. If the configuration of the bricks in your house looks like the ‘Typical cavity wall’ diagram then your house will more than likely have cavity walls. Stone walls are likely to be solid. Steel or timber framed houses and those built from prefabricated concrete have different insulation regulations and will need to be insulated as solid walls. 3. Check the thickness of the walls next to a door or window. If it’s 260mm or greater, the wall probably has a cavity. A professional will be able to tell you for certain in your home has cavity walls or not via a borescope inspection. They can drill a small hole in your external wall and, using a borescope, see inside the wall. Walls are not exposed to driving rain. Who can install cavity wall insulation? With a properly trained professional using the right equipment, the whole process shouldn’t take longer than 2-3 hours and shouldn’t create any mess or disruption. The installer will drill very small holes in several different places around the outside of your house. They then ‘blow’ the insulation which can be mineral wool, foam or polystyrene beads into the cavity. They then fill all the holes in again. The annual savings on your heating bills could be as much as £275 which means that even the largest homes will get their money back in 3 years or less. When you consider that the insulation should last for 40 years or more, and therefore isn’t an expense you’ll have to repeat, this is a great incentive. You’ll also be helping the environment with a reduction in your CO2 emission of as much as 1200kg per year. According to the Energy Saving Trust*, it costs between £330 – £720 (on average) to insulate a typical home, depending on the type of home e.g. a small flat or a large detached home. You could be eligible for a free Cavity Wall insulation grant under the government’s Energy Company Obligation (ECO) scheme in England. To help us to improve our home’s energy efficiency, reduce carbon emissions and reduce our heating bills the government have introduced the ECO scheme. This means that the biggest energy companies are obliged to help people to improve their insulation and heating systems to make them more efficient. You need to be meet certain criteria and be in receipt of benefits to apply. *Figures taken from estimations by the Energy Saving Trust based on fuel prices in March 2016.